It’s hard to do Jewish genealogy and not come across the books and other publications of Avotaynu, the long time publisher of books for Jewish family researchers as well as the publisher of their eponymous journal. While many printed publications have been overtaken by the Internet, many are just as useful today as when they were first printed. This is particularly true of the many books on names by Alexander Beider. Avotaynu tries to estimate the total number of books it will sell to avoid doing re-prints, and as such they end up keeping many books in their warehouse. In order to cut down on their inventory they’re having a Black Friday sale (well, actually November 19-27, so more than a week) on many of their books. Of note, when these books sell out there are no plans to re-print them, so if you’ve been thinking about buying one of these books, this might be your last chance. The books on sale are Avotaynu Guide to Jewish Genealogy, Dictionary of Ashkenazic Given Names, Dictionary of Jewish Surnames from Galicia, A Dictionary of Jewish Surnames from the Russian Empire: Revised Edition, Jewish Personal Names, A Dictionary of German-Jewish Surnames, Russian-Jewish Given Names: Their Origins and Variants, Where Once We Walked: Revised Edition, A Practical Guide to Jewish Cemeteries, Every Family Has a Story, Biographical Dictionary of Canadian Jewry: 1909–1914. Births, bar mitzvahs, marriages, deaths and other records of Canadian Jewry, Library Resources for German-Jewish Genealogy, Jewish Vital Records, Revision Lists in the Lithuanian Archives, and Eliyahu’s Branches. See the sale page for the specific discounts which range from 40% to 74% per book. Note that you need to clock on the Order Now links on the sale page in order to get the discount. If you go to the regular order pages for the books it will charge you full price. Lastly, I don’t get anything from Avotaynu for promoting this sale. I just like a lot of the books they have on sale, and I want people to know about maybe not being able to get them at a later date. You’re welcome to tell them you heard about the sale on this site, but I don’t benefit from any sales they make. I’ve written about Jewish given names before, but I wanted to look at a different aspect in this article. The main thing I’d like to point out is that given names change over time, and someone might be known as one name in one location and as something else after moving to another country, or even another town. Sometimes, for example, a name changed by an immigrant is easy to guess at, since the name has a clear equivalent in the new country. What happens when the equivalent is not considered a good name when the person arrives? Pinkhas is a Hebrew name which is fine in Hebrew, but the anglicized version is Phineas (not so popular). So what name might an immigrant have taken? Philip? Paul? It could be anything. However, that misses the point that sometimes we are staring at a name and have no idea what name it is actually. For example, I had a gg-grandfather whose first name was Shubsa. I didn’t know what name that was, and in the US he went by Sam. Sam is short for Samuel, or in Hebrew Shmuel. Is Shubse some kind of Yiddish nickname for Shmuel? Actually, it’s a Yiddish pronunciation of a variant of Shabbtai, a totally different name. There’s a derivation there which can be discovered, but it’s not the most obvious derivation to someone who doesn’t know Yiddish and is unfamiliar with the name. Indeed, for my gg-grandfather there was no easy English equivalent (such as someone name Yitzkhok going by Isaac, or someone named Yishai going by Jesse), which is why he went by Sam. I’ve created a chart below that takes a small sampling of names, and compares what they look like in Hebrew, Yiddish, Polish and of course English. For English, I’ve given two versions which are the Anglicized version (i.e. the version likely to appear in an English-language bible and to be used by people in English-speaking countries today) and the transliterated version of the original Hebrew name (used by some religious Jewish people even today instead of the Anglicized version, but is mainly there to illustrate the difference between the Anglicized version and the original). In the case of Yiddish and Polish names, there are many other possibly variations for many of the names listed. I’ve tried to list either the most commonly used and the most clearly different names (i.e. ones you would be unlikely to track backward to the original without help). Don’t hold me to being consistent with my transliteration of the Yiddish and Polish names. My goal was to make them readable, not consistent. A few more notes. I use the letter-pair kh to represent the Hebrew letter Khet (ח). In English the more common pairing to use for spelling is actually ch, such as in Chanukah, although for the same reason Chanukah is frequently spelled Hanukah instead (because in English we reserve the ch pairing for a totally different sound, such as in the word ‘chair’) I use the pairing kh which is distinct from h, but cannot be confused with the sound we normally use for ch. This is why I write ‘Rakhael’ for the Hebrew transliteration of Rachel, but put ‘Rachel’ in parenthesis since in fact most women who bear this name write it as ‘Rachel’ even if they pronounce it as ‘Rakhael’. In fact, I’ve seen some people write their name as Rachael, which is a mix of those approaches (yet something which doesn’t help people to pronounce the name correctly). 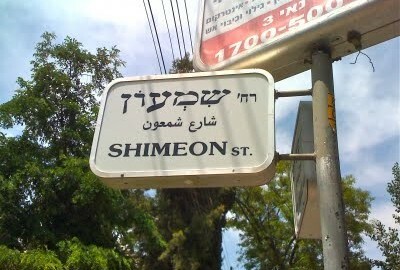 If one were to transliterate the Hebrew name properly, it would be Shimon St. In English, however, the name was anglicized into Simeon, or Simon. Somehow the person determining the proper name in English combined the proper transliteration (including the Sh sound instead of S) but also included the anglicized contribution of -eon from Simeon, even though that sound doesn’t exist in the original Hebrew. It was actually this sign which put the idea in my head to write this article. I give the city a hard time, and indeed the mis-named streets are a long-running joke among native English-speakers in Israel (as are mis-spelled and mis-translated restaurant menus), but they have gotten better over the years. I once noticed a street that had three different English spellings on three different street signs for the street, including two different spellings on different sides of the same sign. They later changed them to all be the same. 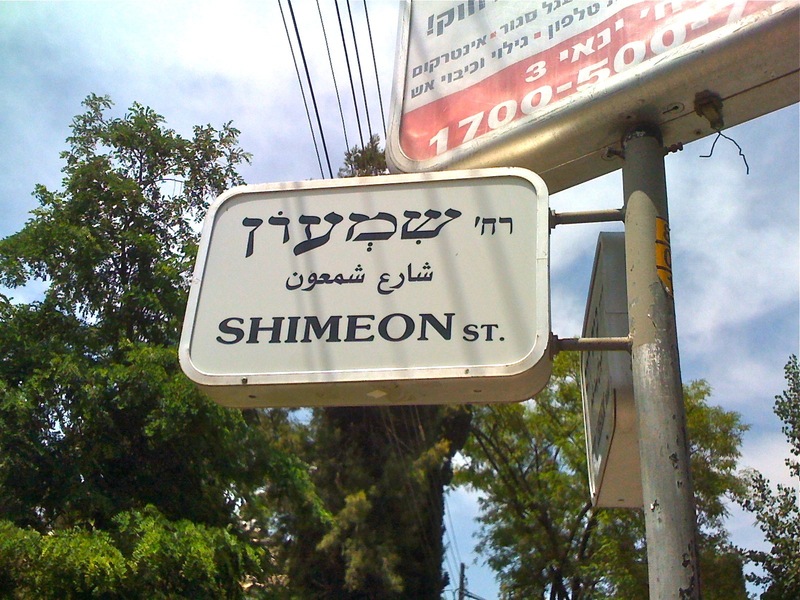 My favorite street in Jerusalem is Abraham Lincoln St., where in Hebrew they pronounce the silent l, and get something like Avraham Linko-lin. Try to pronounce that name with the correct English pronunciation to a taxi driver, and you won’t get anywhere. Pronounce it Linko-lin and you’re golden. I should add that these examples (besides being amusing) are intended to help you realize that just like government bureaucrats in these cases didn’t bother to spend the time to find the correct spelling or pronunciation of a name, when one’s ancestors were traveling through Europe, getting on ships, arriving in the US, similar bureaucrats may also have not spelled things correctly. Also, while we are pretty strict with spelling these days, it was not a sacrosanct a hundred years ago. Beider’s Dictionary (and its less expensive Handbook version) is really an amazing resource, but keep in mind when using it that it does not attempt to bring any modern context to the names. For all intents and purposes it ends its look at the names mentioned around 150 years ago. This is not a criticism, just an acknowledgement that the book does not try to look at the evolution of the names into the 20th century. It is still incredibly useful, but you will not find any information in the book about modern usage or changes in the names. Hoffman and Helon’s book on Polish names is a great book and a bargain. It is a publication of the Polish Genealogical Society of America, and is not specifically Jewish, but it has broad coverage of Jewish names, and shows the Jewish roots of many Polish names. It points out the different pronunciations and spellings of names that came from different regions, and when there is a specific Jewish version it generally points it out. Gorr’s book, which was finished after his death by Freedman, is certainly not as scientific a look at the history of given names as Beider’s, but it is nonetheless very important as a look at the actual usage of many of the names listed in this brief work. Unlike Beider whose name variations are shown using transliteration, Gorr’s book shows the variations with the original Yiddish (in Hebrew lettering) and transliteration. Considering the difference in spelling between Hebrew and Yiddish, this is a very useful feature of the book. It’s a short book, but with some great information. Feldblyum’s book on Russian names has the most interesting story behind the book. It is largely based on a Russian book published in 1911 by Iser Kulisher in Zhitomir, Ukraine. The book was intended to help government bureaucrats make sense of all the variations of Jewish given names. This was a serious problem, as people were forbidden to change their name as recorded at their birth. If they were listed in a document with even the slightest variation of their name, the listing was considered a different person. 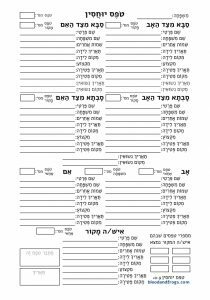 To use an example from the book, if a tax list showed that Moshe paid his taxes, but his name in another register was listed as Mojshe, then he could be taxed again. Cohn’s book on Yiddish names, like Gorr’s, was also published posthumously. As an academically published book it is incredibly expensive (listed at $165). For that price, you get much less than the much larger, more comprehensive (and at $85 cheaper) Beider book (or even in some ways the $29 Handbook). The introductory essays of the book are good, but the lexicon itself is a bit frustrating. For example, for a book on Yiddish names, it doesn’t actually include the original Yiddish spellings in the book at all, only transliterations. Truthfully, Beider doesn’t include the names in their original Yiddish either, but at least he references the Hebrew names they are based on (in Hebrew) and provides an index of the Yiddish names in Hebrew letters in the back of the book. Cohn offers an index of Hebrew names as well, but oddly transliterates those too. Her index of English names and the Yiddish equivalents is useful. I wonder if some of these shortcomings would have been fixed if Cohn had lived to finish the book herself instead of having it finished after her death. For web sites, one place to look is the Given Name Data Bases (GNDBs) at JewishGen. Truthfully, this database drives me nuts. It appears to have been last updated in 2003. You can search for ‘European’ names or ‘Foreign Names’ which means, for example you can search for names that were from Poland which is European and see what people changed their names to in the United States which is Foreign. In reverse, you can choose a Foreign country and see name changes to a European country. The records that you see are as varied as the people who filled out the information that makes up the database. Some records provide many alternate names, some don’t. It would seem the database is in need of a major overhaul, and merging into a single database would be a nice start. 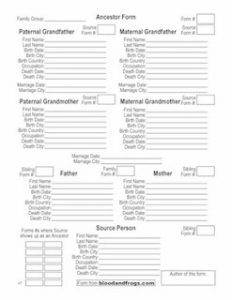 Also, beyond this major limitation, it doesn’t actually tell you the origin of the names, but only what the person who filled out their individual information filled out. The information therefore can be very useful for trying to figure out what someone named Berish who lived in Romania and moved to Argentina might have changed their name to (Bernardo) but it’s more hit-or-miss when trying to just find out about the name Berish (you nee to pick European/Foreign pairs to search and hope you get lucky). A general site on given names called Behind the Name, has a section on Jewish names which is very useful. The site shows the etymology and history of names, and will show the language of original (Hebrew or Yiddish for example). If the name was originally in Hebrew or Yiddish, the site will also give you the name in Hebrew letters. Another useful site, believe it or not, is Wikipedia. Obviously it’s not consistent on how it deals with names, but there are many Wikipedia entries on given names. Try searching for a name and add ‘given name’ to the search. For example, see these entries for Israel (name) and Rebecca (given name). What’s your favorite name story? What name did it take years for you to decipher? Post your stories in the comments. 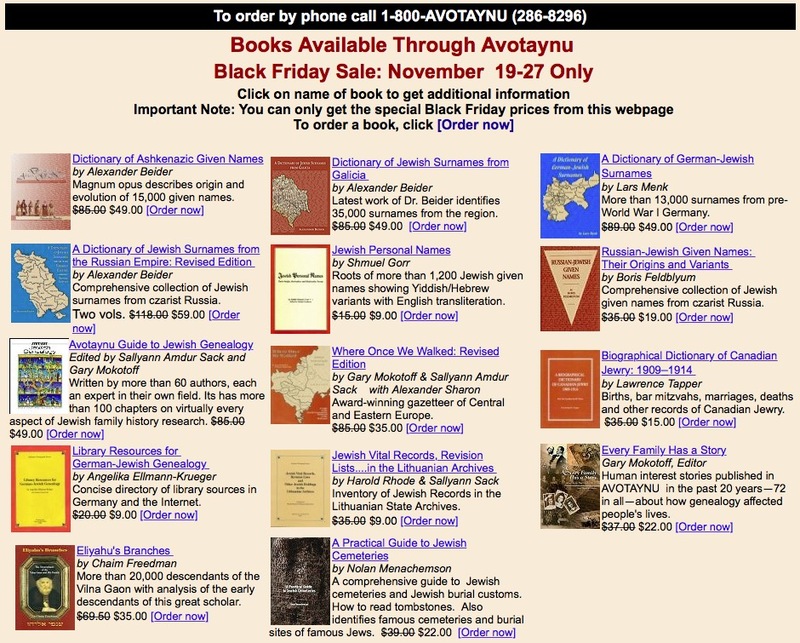 It’s hard to do Jewish genealogy and not run into Avotaynu, the long-time and as far as I can tell only publisher dedicated to publishing books on the topic of Jewish genealogy. They also publish a self-titled quarterly journal, Avotaynu, on Jewish genealogy and an e-mail newsletter called Nu, What’s New?. Avotaynu mostly sells their own books, but occassionally sells other books as well. On set of books they’ve been selling for years is NYU Press and Yad Vashem’s The Encyclopedia of Jewish Life Before and During the Holocaust. 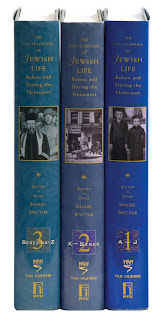 It’s a three-volume set that provides details on many of the Jewish communities that existed before the Holocaust. It is essentially an abridgment and translation of Yad Vashem’s much larger Hebrew set called Pinkas HaKehilot, published over many years which covers in much greater detail each of the Jewish communities that existed before the Holocaust and what happened to them during and after the war. I highly recommend this set for anyone researching their families in Europe before the war, as it provides a lot of information on many communities that are hard to find out about elsewhere. In this weeks’ Nu, What’s New? e-mail, Avotaynu mentions that while the set costs $199 on Amazon, they are currently selling it for only $99 plus shipping, per arrangement with the publisher. Shipping from Avotaynu is $20 in the US. So $119 for the books plus shipping. NYU Press, the publisher, is also selling it for $99 plus shipping on their own site, with the use of a coupon code (see their site for the code). Oddly they show the $99 price as a discount from $350, yet if you go to the regular page for the set, it sells for $199. In any event, it’s currently $99 plus shipping. I don’t know what the shipping costs are from NYU Press, as you need to become a member of their site to find out. 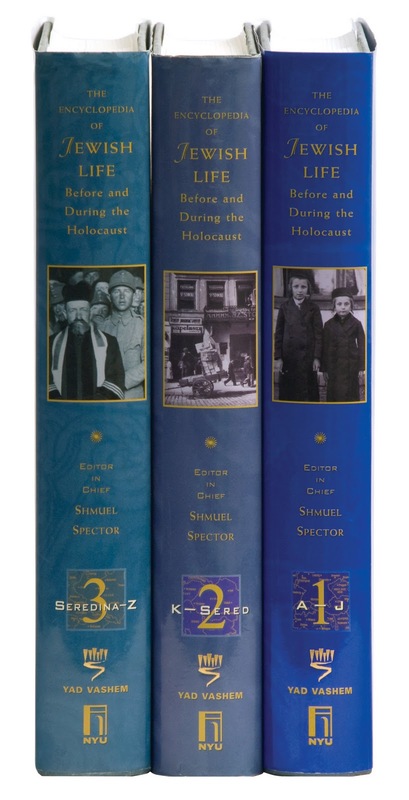 Interestingly enough, Yad Vashem also sells this set directly from their web site. However, Yad Vashem sells it for only $55. Shipping within Israel is free from Yad Vashem, so if you live in Israel it would seem to be a no-brainer where to order it from. If you live outside of Israel, shipping costs $55 which while high, still brings the total cost in the US to $110 instead of the $119 from Avotaynu. In short, if you live in Israel, definitely order it from Yad Vashem directly. If you live in the US, perhaps check out how much NYU Press is charging for shipping before deciding where to order from. I highly recommend this set for anyone researching their family in Europe.